This city is a never-ending feast of gallery openings and special performances, museum exhibitions and seasonal celebrations, many available for little cost. You can enjoy three course meals for US$20 or less, and you can spend hours in a café , seeing and being seen, for the price of but a single café au lait. You can join conversation groups, discussion groups, book clubs, and cooking classes often for very little cost, even free. Of course, walks among the centuries-old rues of the Latin Quarter and gallery openings don’t substitute for dinner on the table or wi-fi access. That’s OK, because, in France, even in Paris, the more practical necessities of life can also be a bargain…if you know your way around and where to go for the best deals. When we were preparing for our move from Paris to Panama City, my husband Lief presented me with a budget showing that it would cost slightly more for our family to be in Panama City, Panama, than it had been costing us to live in Paris, France. My husband, the accountant, assured me his figures were correct, and, indeed, Lief’s projections have played out. Our day-to-day cost of living in Panama City is a little higher than it was in Paris. 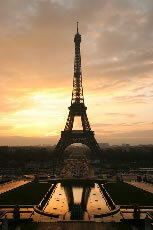 Paris is the most beautiful, most romantic city in the world. It’s also a place where your cost of living can be hugely variable and highly controllable. That is to say, you don’t necessarily need a royal’s budget to be able to enjoy life in the greatest city on earth. In Paris, you can live happily car-free, walking nearly anywhere you’d want to go. The butcher, the baker, the grocer, the wine shop, a half-dozen busy cafes, and as many lovely parks and gardens are all less than 15 minutes’ walk from almost any point in central Paris. And, when you want to venture beyond your quartier, the Metro will transport you from restaurant to nightclub, from museum to café for around US$2. France boasts perhaps the world’s best infrastructure, and it’s a bargain. Cable TV, Internet, and telephone, as well as the Metro, the bus, and the RER train system…all are likely less costly than comparable services where you’re living now. Our phone plan living in Paris cost less than 40 euro per month and allowed unlimited free calls anytime to anywhere in the United States and anywhere throughout Europe. That’s hard to beat. 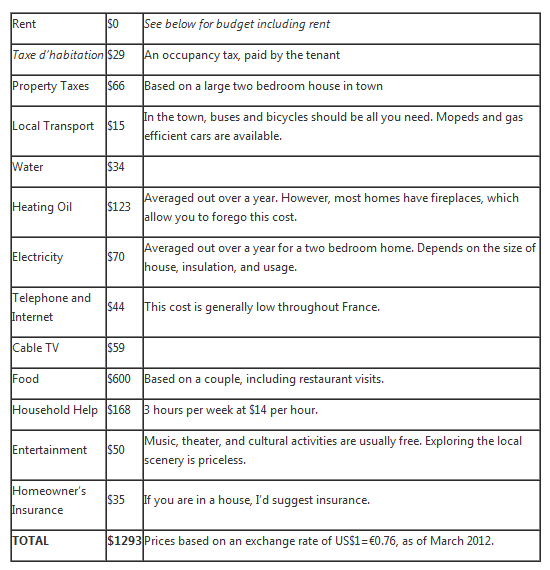 My point is not that you should plan to move to Paris to reduce your cost of living. It is possible, in fact, to do just that, but that’s not the typical agenda where Paris or France is concerned. My point is that you shouldn’t deny or delay your dreams of la vie française because you’re worried you can’t afford them. We lived in Paris for four years, with two children, and I’m here to tell you that we were able to control our costs within a very reasonable budget. And oh what a lifestyle that budget bought us! And, of course, Paris is only the beginning of France. The charms and appeals of French Country Life are likewise unrivalled. After spending a year on the road, trying a series of places on for size, Euro-Correspondent Lucy Culpepper and her family chose to settle in the “other” south of France. Not Provence (which, yes, is pricey), but southwest of there, in Aquitaine. Not everyone is cut out for life in the Tropics or the developing world. If you, like Lucy, are more interested in Old World living, you, like she, could find this region of France offers just what you’re looking for. Lucy also spends a lot of time with her extended family at the other end of the Pyrenees, in the Languedoc region. This is big wine country, with a long history and a lot of heart. And, again, this part of the country is cheap. Lucy explains that a retired couple could live comfortably here on a monthly budget of US$2,000, including rent. Sometimes called the “other” south of France, there lies a charming and affordable region located between the Provence-Alpes-Cote d’Azur to the east, the Midi-Pyrenees to the west, and the Auvergne to the north, while Spain is only a few hours drive to the south. Very Mediterranean and influenced by its proximity to Spain, it’s hot and dry in the summer, wet in the winter, and cool and clear in the spring and fall and enjoys many days of sunshine each year. This is a region of warm colors, sleepy villages, mountains, gorges with cascading rivers, endless vineyards, olive trees, colorful markets, the Canal du Midi, and the gentle waters of the Mediterranean coastline. It is also the land of the Cathars and boasts incredible historic sites, including Carcassonne. It may not be the cheapest place to retire to in the world, but it is colorful, eclectic, always changing, never following a formula, and very open to retirees. Yet, here, you can live on a very affordable budget. Rent for a basic two bedroom home starts out at under US$700 a month (based on euro exchange rate as of April 2014) . Or, purchase a home…charming fixer-uppers start at about the US$50,000 range, while modern stone villas will set you back around US$350,000. What if you’d rent? US$665 a month can get you a 70 square-meter two bedroom villa in town. Long term renters will likely need to pay the taxe d’habitation, but you’d be off the hook for property taxes and homeowner’s insurance. You could therefore expect to budget a little over US$2000 for your monthly expenses. What about health care? I haven’t included the cost of health care here, as it can vary wildly from one person to the next. The health care system in France is the best in the world, and if you become a legal resident, the cost for care can be nearly negligible compared to what you’d pay Stateside. Otherwise, we recommend Bupa International for your global health care coverage. France is a country of superlatives. Its health care, for example, is the best in the world. For years, the World Health Organization (WHO) published an index rating and ranking the quality of the health care in all the countries of the world, and, year after year, France came out the winner. If you’re a legal resident, health care in this country is also highly subsidized by the government, sometimes even free. Which raises a critical question: Should you become a full-time legal resident of France? It can be easier to do than you might imagine. The truth is, becoming a resident of this country isn’t necessarily the challenge. The challenge is facing the tax liabilities that can ensue. However, you can plan for and mitigate your tax burden as a full-time foreign resident in France, if you get the right help from the start. 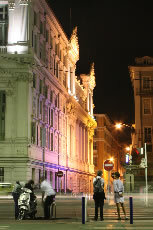 France Starter Kit – The ever-expanding and comprehensive France publication package. This full report is everything you need to get started in your consideration of France.